Brimming with heartfelt relationships and authentic high-school dynamics The Start of Me and You proves that it's never too late for second chances. It's been a year since it happened-when Paige Hancock's first boyfriend died in an accident. After shutting out the world for two years, Paige is finally ready for a second chance at high school. . .and she has a plan. First: Get her old crush, Ryan Chase, to date her-the perfect way to convince everyone she's back to normal. Next: Join a club-simple, it's high school after all. But when Ryan's sweet, nerdy cousin, Max, moves to town and recruits Paige for the Quiz Bowl team (of all things!) her perfect plan is thrown for a serious loop. Will Paige be able to face her fears and finally open herself up to the life she was meant to live? Oh, guys. Oh, man. I think I’m in love. I KNOW I’m in love. This book made me feel all warm and fuzzy and I just wanted to reread it the second I put it down. I love, love, LOVE books with strong friendships. I honestly like reading about friendships more than romantic relationships sometimes. Paige has three of the best friends in the world. The four of them are a unit, and even when they fight, they never hesitate to act if one of them needs help. They’re best friends in every sense of the word and I adored their joking, heart-wrenching, supportive moments. And even though they’re complete as is, they also form real, close friendships with Ryan and Max over the course of the novel. I loved how these two boys fit in with the girls, how natural it was for them to join the group. And then there’s the romance between Paige and Max. It’s so adorable and geeky and wonderful that I’m smiling just thinking about it. I just want to watch them fall in love over and over again. 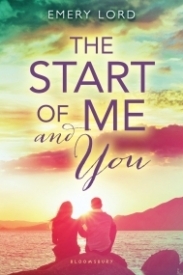 The Start of Me and You is a contemporary novel you just can’t miss. Seriously…go out and buy it NOW. Emery Lord debuted incredibly strongly with Open Road Summer. Her debut proved her talent in writing character, friendship, and romance. I loved it so much that Bloomsbury actually put my blurb on the back of the ARC. (Shameless bragging I know, but it’s never happened before and I’m excited!) The Start of Me and You has all of those same qualities in spades. In fact, I think The Start of Me and You actually manages to improve upon Open Road Summer, with its heartfelt look at family, its beautiful character arcs, and its message of embracing life. Emery Lord has done it again. Paige Elizabeth Hancock is tired of That Look. She’s tired of being defined as the girl whose boyfriend drowned. Even though it’s been two years, everyone knows about Aaron, so she’s seen as a grieving widow, even though they’d only been together for a couple of months. Going into her junior year, Paige wants to finally finish grieving and get a fresh start. With this in mind, like any good planner, Paige makes a list of goals: 1) go to a party 2) join a group 3) date 4) travel & 5) swim. The Start of Me and You is a romance at its heart, but there’s a lot of other things going on here. For all that the ship is central, there’s very little actual romance in it. Though it feels fluffy, The Start of Me and You gets pretty sad sometimes too. Emery Lord excels at really building lives for her characters. It’s not just about Paige’s love life, but also about all of her family relationships, her friendships, and her feelings about Aaron. That’s a lot to handle in one relatively short novel, but Lord gets it done like a boss. Paige starts off on the list like the goal-oriented girl she is, expecting to be a better her by the time she hit the end of it. She finds, as all of us do, that life isn’t that simple. What she thinks she wants isn’t necessarily going to be what she needs, and she can’t rush to acceptance. It’s a process. Life is a process. We’re all of us constantly growing, changing, and learning from our inevitable and plentiful mistakes; at least, we’re learning if we’re wise enough to pay attention. What I love so very much about The Start of Me and You is that in pretty much every character we get to know at all, this is so evident. Heck, we even get a small window into Ryan’s ex-girlfriend who makes a brief appearance. These characters are so dynamic, and the arcs are powerful. Years before the book began, Paige’s parents got together. It was a painful time, but Paige was glad that they got divorced, because they were so much healthier and happier apart. More to the points, they were better parents apart. At the beginning of the novel, they drop the bombshell that they’re dating. Each other. It’s supposed to be the dream of every kid whose parents are divorced right? For Paige, it’s not. Paige doesn’t take the news well, and, as much as she is really built to, rebels. She’s very much not supportive. This leads to fights with her younger sister, who takes a more Hayley Mills or Lindsay Lohan approach to parental reunion. The Hancocks are a very loving and believable family, but they have their issues to resolve. When the novel closes, things aren’t perfect, but they never can be; they are, however, hopeful. Even more than those family relationships, I adored Paige’s with her grandmother. Paige tells her Grammy everything. Though Grammy’s memory is going, Paige will tell her over and over, because that’s how much she loves her and respects her advice. Her Grammy is a real hero for her. Their relationship is so sweet and a little bit sad. Also, Grammy is such a shipper, which I love her for forever. The friendships too are a thing of a beauty. Paige has three close friends: Tessa, Kayleigh, and Morgan. Tessa and Paige are besties, as are Kayleigh and Morgan, but the group as a whole is very solid. That doesn’t mean that jealousies and fights don’t crop up, because of course they do, but they always get dealt with. Bottom line: they’re always there to support one another. The way the heroine in Open Road Summer reacted to female characters who weren’t her best friend was the biggest issue that I and many others had with Lord’s debut, and nothing remotely similar is present in The Start of Me and You. In junior year, those four add two new friends: Ryan Chase and his cousin Max Watson. Ryan was Paige’s goal boy for that third goal, dating. Max, who’s also his best friend, quickly becomes one of Paige’s best friends. They bond over literature, grammar, and pop culture. Obviously, I had some amount of feels about this. No, for real, Max is one of my favorite book boys ever. He’s so smart and adorable and nerdy banter like WHOA. While I would have liked a few more chapters of happy coupleness at the end, this book still has one of the hottest non-kiss scenes ever in a book. 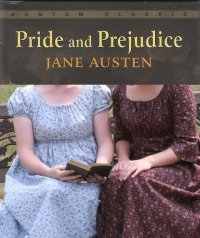 For the record though, there will actually be kissing, but prepare to do a lot of shouting at the book first. My reservations regarding The Start of Me and You are so trivial that some of you will probably laugh at my nitpicking, but I can’t leave them unsaid. Paige is a “Grammar Girl,” though she’s embarrassed by the designation. Yet, this happens: “me and Aaron” (48). It’s in the title too. While the internet is of two minds about whether putting yourself first is grammatically incorrect or just impolite, I really don’t think it’s something a grammar nerd would do. Paige also claims to be a pop culture aficionado, but she didn’t know there was more than one Indiana Jones movie. She’d also never heard of Firefly and didn’t bother to look it up. Small, yes, but they made me question Paige a bit. Let’s be real, guys. I’ll be reading absolutely anything this woman writes; I don’t care what it is. Any author who can bring the swoon like this is an author I will keep reading. It’s been a year since Paige’s boyfriend died from a drowning accident. She shut out the world since then but now, she’s ready to start moving on. She has a plan to help her. First: date Ryan Chase, her first crush. Second: join some school clubs. She’s thrilled when Ryan starts talking to her and wants to hang out with her and her friends. What she didn’t count on was Max, Ryan’s sweet but nerdy cousin tagging along. Max, captain of the Quiz Bowl Paige has agreed to join. Max, who makes her smile and who is impossible to ignore. This book was cute, just so cute. I had a smile on my face most of the time while I was reading it. I really enjoyed Emery Lord’s first book, Open Road Summer, but this one topped that one. It had a lot of the elements I loved from the first book but added more to love. I really felt for Paige through the book. The book was her journey of healing from both her boyfriend’s death and the fear and PTSD that she suffered from afterward. It was also about her re-discovering herself after being ‘the girl whose boyfriend died’ for so long. She was a genuinely nice person and so loyal to her friends. I loved the relationships she had with her friends, the ones that developed with Ryan and Max, and the ones she had with her family. All of them were so well written and believable. Paige’s group of friends was small but close. Each of them had a very distinct personality so they all stood out. The friendship between them was one of my favourite things about this book. There were fights and disagreements and uncomfortable moments just like in any friendship but they knew they had each other’s backs no matter what. Adding in Ryan and Max to that small group made for an interesting dynamic and I really liked that it was more focused on friendship and supporting each other than on romance. Not to say I didn’t enjoy the slow burn romance. It was very cute and sweet. Each moment made me fall more for Max. He was so perfect for Paige even if it took her a while to figure it out. And he loved Firefly! Heart stolen. The plot was a lot more complicated than just being about Paige trying to succeed with her plan. It was about facing her fears, about falling for the person instead of a pretty face, about realizing and going for your dreams. It was about strong friendships and new romances. It was about healing and about growing up. It was impossible to put down.